Home »» Office 365 »» How To Manage Office 365 Licenses Using Groups? The biggest challenge for any Office 365 Administrators, is managing Office 365 licenses purchased by their Organization effectively. 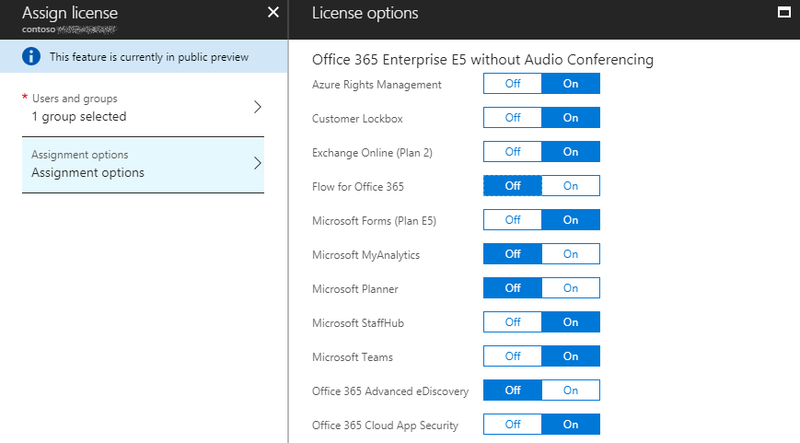 So far the Office 365 admin center doesn’t provide much options to automate Office 365 license assignment effectively. For smaller tenants, manual process provided by Office 365 admin center should suffice. For larger Organizations, automating license assignments is necessary, since the manual process is tiresome and error prone. Hence, the administrators has to spend significant amount of time, to prepare complex PowerShell scripts to achieve the level of automation, they require. Considering the feedback provided by their customers in automating license assignment, Microsoft has introduced a new group based Office 365 license management system through Azure Portal which is currently in Preview. This group based assignment system, can be used for both groups created in Azure AD and also groups synced from On-Premises Active Directory. Once you open your Azure Portal, navigate to “Licenses” section present in Azure Active Directory. The list of products, currently available for Organization, will be displayed in the Licenses page. Select the product license, which you want to assign to groups and click on “Assign” button. Once you click on Assign button, User Selection page will appear. In the “Users and Groups” field, you can select the list of groups, you want to assign the selected products. Once the User selection is complete, “Assignment Options” will display, the list of services available for the selected product. You can disable some of the features, if you don’t want to assign them to a group. Click “OK”, when you are done with your selection. Then, when you click on “Assign”, the selected product will be assigned to all the users in the selected group. You will receive a notification in Azure Portal, if the license assignment is complete or if any there is any issue in the license assignment. Once the license assignment is complete, when you look at the “Licenses” page in Azure Portal, the list of licenses which are inherited to groups will be shown. To complete the Groups based license assignment process, you have to remove all the direct licenses assigned for the user. For example, when you open the licenses page of a user, the list of products assigned for the user will be displayed. You can remove the licenses which are assigned directly for a user, to enable group based licensing. You should be more cautious, when removing direct licenses for the selected users, since the user’s access to services should not be disrupted when removing these licenses. Since the groups based license assignment is in preview mode, the procedure mentioned above may change once it is generally available. Right now group based license assignment doesn’t support nested groups. Licenses are assigned only for the first-level users. Licenses assigned for a user through group can only be managed from Azure Portal. Managing these licenses from Office 365 Admin center will throw error. To use group based license assignment Azure Subscription is required, at least for now. It may change once it is generally available. When new services are added by Microsoft to a product, it is automatically assigned to the users in group. Need an Efficient Office 365 License Management Tool to Assign, Remove & Recycle O365 User licenses effectively! Try Vyapin Office 365 Manager! How to move SharePoint servers to different domain (new AD) without losing the data integrity with limited time and effort? SharePoint Migration vs Upgrade: When it is Recommended?